NBC was contracted to remove a few inches of bird waste that had collected at the top of the bell tower at Widener University in Chester, PA. Apparently at one time, someone thought that the birds in the bell tower would fly out if they opened a window. Instead hundreds of other birds joined their friends inside the tower where they have now lived for years. NBC Environmental removed the waste and restored the top of the bell tower for future use. School districts, colleges, and universities are commonly in need of an environmental contractor because the building are often older and built with asbestos, and/or susectible to mold. A qualified and certified environmental contractor linke NBC Environmental is a great resource for these educational institutions. Our core services are mold and asbestos removal but we also specialize in replacement of areas and materials that are commonly affected by mold and asbestos. For example, when we remove insulation we also replace it so you do not have to call another contractor to handle the rest of the job. We serve individuals and businesses all over the Philadelphia area including West Chester, Media, and Springfield PA.
Environmental Assessments: If you suspect that an area has asbestos or mold or you are planning on demolishing an area that may contain hazardous materials it is important to have an Environmental Assessment. 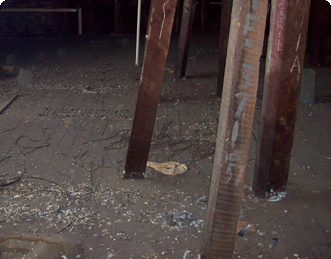 Interior Demolition Services: We have the right equipment and attention to detail to demo the inside of your building. Don't trust your home to just anyone. Re-Insulation Services: Your home's or business's insulation may contain asbestos or be susceptible to mold. After we remove the hazardous insulation we replace it as well. Thermal Insulation Services: With the rising cost of energy it pays to install high quality thermal insulation. You can easily pay for the cost of the services in savings on your heating and cooling bills. Oil Storage Tank Removal: Removing old oil tanks is a difficult and potentially hazardous procedure. We remove hazardous materials every day so we know what it takes to remove an oil storage tank quickly and safely. Demolition Services: Any workman can swing a sledgehammer but certain jobs call for a little more caution. Our demolition services specialize in the jobs that other contractors hate to do. Testing Services: You won't know if you have an asbestos or mold problem unless you test for it. Potential problems are too serious to leave to chance.